BREWERS FANS AND COLLEAGUES OF VARIOUS MILWAUKEE COMPANIES DONATED TOOLS TO SUPPORT HOUSING RESOURCES, INC. 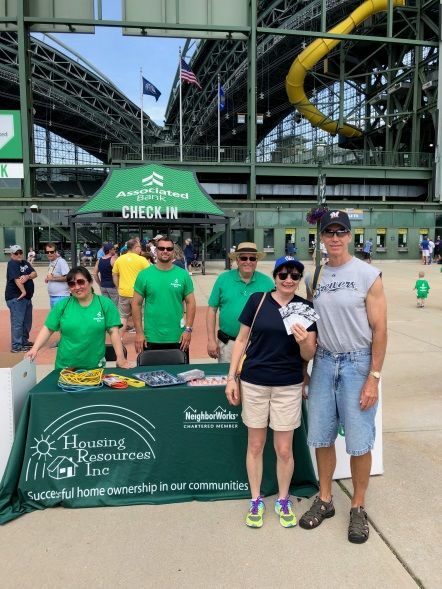 Brewers fan donated tools in exchange for tickets to an upcoming game at the Stock the Box™ tool drive at Miller Park on Father’s Day, June 17. For the fourth year, Associated Bank and Brewers Community Foundation teamed up to host various Stock the BoxTM tool drives to support Housing Resources, Inc. (HRI). Brewers fans and their families were invited to donate new or gently used tools at a tool drive on Father’s Day at Miller Park. In addition, Briggs & Stratton Corporation and We Energies hosted a corporate tool drive for colleagues that was attended by Brewers player Corey Knebel. The combined drives collected 716 much-needed tools for HRI’s Tool Loan Center, a low-cost solution for local homeowners who wish to do their own home repairs and maintenance. HRI also loans tools to community organizations to aid in neighborhood clean-ups, beautification or maintenance projects.